Does the creation of an e-learning course you are planning require the involvement of a subject matter expert? Subject matter experts, or SMEs, and their contribution to your course can determine its success. It’s important, therefore, you get the interaction right from the start. In practice, this means ensuring the working relationship between your SMEs and e-learning development team are as good as possible. After all, your e-learning development team is likely to be a third-party expert. You’ll need to build the appropriate bridges between them and your SMEs while also making sure your expectations are clear. Here are 12 tips to help you get the most from SMEs when developing a new e-learning course. This is an important additional point to the one above as it’s equally important you don’t waste an SME’s time by including them in parts of the course creation process that they are not directly involved in. In other words, you must strike the right balance between involving them from the beginning but not involving them too much that they spend time on the e-learning course development process when they are not required. For most SMEs, their time will be valuable. Plus, creating an e-learning course may not be central to their main area of responsibility. Instead, the e-learning course might be additional work. Therefore, you need to make it as easy as possible for SMEs to participate. This includes, for example, making sure all the preparation work before meetings is done, so your team can get straight into getting information from the SME. Your e-learning developers will probably know what they need from your SMEs, but it’s important you have realistic goals and expectations too. In most circumstances, your expectations should be limited to the SME contributing his/her knowledge and expertise to the e-learning developers and then providing feedback at various stages of the course creation process. As for everything else – leave that to the e-learning experts on your development team. Creating an e-learning course that requires the involvement of an SME is a collaborative process. This means good communication is essential, so it’s important you help to establish this from the very beginning. It is often also helpful to explain the course creation process to the SME. You or a member of your team can do this, or the e-learning developers can help. After all, your SMEs are experts in their fields, but they are unlikely to have much expertise in e-learning or creating modern, user-friendly training courses. 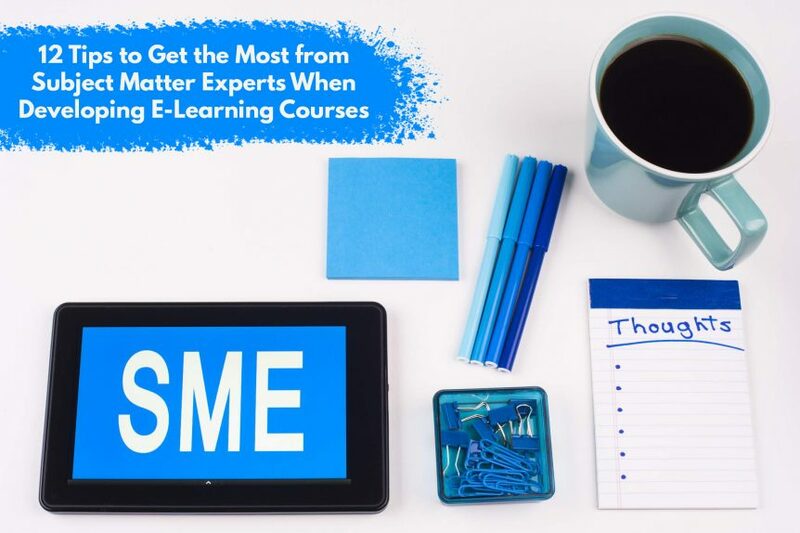 The SMEs involved in developing your e-learning course should understand what you want them to do and how long you think that should take them. Providing this clarity will help ensure you get the buy-in and commitment you need. One of the biggest problems that e-learning course developers face is scaling back the content SMEs give them. This is because a good e-learning course developer will always pitch the courses they develop directly at learners. SMEs will inevitably be on a higher level than this, so may want to include more information than is necessary or go into too much detail. This runs the risk of drowning learners in content or confusing them unnecessarily. Helping learners understand who you are pitching the course to can help avoid this from happening. Getting your e-learning developer to show SMEs good examples of e-learning will help them better understand what you want to achieve. SMEs may provide feedback on the e-learning course at various points. Taking into account some of the points above, including the point about ensuring the content of the course is appropriate for learners, it’s important to take SME feedback on board. After all, you are including them because they are experts in their field. If they say something is not right, particularly in relation to the content rather than the way it’s presented, you should listen. It’s also important to acknowledge the work SMEs put in to helping with the creation of the e-learning course. Finally, it can also be helpful to provide post-delivery feedback to SMEs. This includes feedback on how learners received the course, the learning outcomes achieved, and how the course helped achieve business objectives. This helps learners connect their work to tangible results and can help secure their cooperation with future e-learning course development projects. SMEs can be invaluable to the creation of your e-learning courses and broader training strategy. The tips above will help you get the most from them.